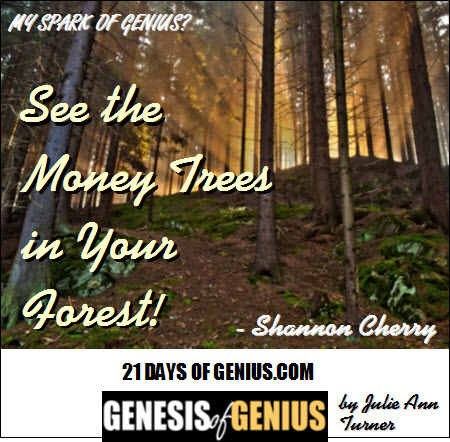 20.5 See the Money Trees in Your Forest! Shannon Cherry, APR, MA - Three-time Amazon bestselling author, who helps experienced and ambitious entrepreneurs, coaches and consultants to create and grow the business they desire– without compromising on their sincerity and principles. To read Shannon's full "SPARKS OF GENIUS" Insight - plus those of 100+ global creators & visionaries - all included in our new SPARKS OF GENIUS eBook - be sure you're signed up for your reminder to buy the GENESIS OF GENIUS Book on Launch Day, Oct. 24 - where the complete SPARKS OF GENIUS eBook will available as a FREE bonus!